Mapped from DEP Wetlands data: salt marsh and barrier beach–salt marsh. 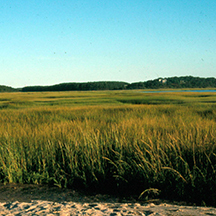 Salt marshes are coastal vegetated wetlands generally covered by two species of cordgrasses and comprised of two distinct habitats known as high and low marsh areas. High marshes are areas above the mean high tide mark that are only inundated during storms and extreme high tides called spring tides 14. This habitat is distinct from low marshes in that low marshes occupy zones between mean low and mean high tide, and are flooded twice daily with salt water. Consequently, salt marsh vegetation is zoned by this tidal distinction, with saltmeadow cordgrass (Spartina patens; also known as salt marsh hay) and salt grass (Distichlis spicata), dominating the high marsh, and smooth cordgrass (Spartina alterniflora) dominating the low marsh 16. Marsh habitats generally occur in a variety of environmental settings; salt marshes are exposed to high salinities, while higher elevation brackish marshes occur in inland areas of less salinity. This habitat gradient allows a variety of plants and animals to use coastal and inland marsh systems. Salt marshes maintain their elevations relative to sea level by processes of erosion, sediment deposition and trapping (by plants), biomass accumulation, and the decomposition of biomass. Salt marshes perform a number of important ecosystem services including nutrient absorption and water quality improvement; storm protection from flooding and erosion; carbon sequestration; critical habitat for fish, birds and invertebrates; and opportunities for recreation 2,9,11. Salt marshes act as a buffer between marine and terrestrial aquatic environments, they capture excess sediment and nutrients from terrestrial runoff, while protecting inland habitats by stabilizing soils and absorbing storm surge and flooding. Salt marshes serve as excellent habitat for migrating and overwintering waterfowl, shorebirds, and numerous marine organisms 9. Massachusetts recognizes 32 Species of Greatest Conservation Need that depend on salt marshes 9. Many birds use salt marshes for feeding, such as American oystercatchers, egrets, herons and sandpipers. Some birds nest there as well, such as American black ducks, terns, saltmarsh sparrows and willets. Salt marshes occur alongside sounds, bays, and intertidal creeks, which are important spawning locations for many anadromous fish species, such as smelt, alewife, and blueback herring. They are also home to plant species such as saltpond grass and pennywort. Salt marshes are vulnerable to inundation as sea levels rise and storm surge increases with changing climate 8. Salt marshes, however, can keep up with sea level rise through accretion (depositing plant material and capturing sediment), which enables marsh migration inland and uphill 11. However, this process is restricted in many locations by human infrastructure. For example, dams on rivers and streams trap and retain sediment that would otherwise flow into salt marshes. Salt marshes in Rhode Island are already showing evidence of being overwhelmed by rising sea levels. Perhaps most important is that in many places along the Massachusetts coast, salt marsh migration may be restricted due to a lack of adjacent inland or upland habitat due to coastal development. In some areas, marshes are still rising or “rebounding” after the retreat of ice sheets from the last ice age 12, a process that further combats sea level rise 5. Although salt marshes are capable of adapting to rising sea levels, it is unclear if they will be able to keep pace with future rates of change. Evidence suggests that some marsh systems can keep up with recent rates of sea level changes 6,13, while others cannot 1,11. Rates of sea level rise have fluctuated widely over geological time scales; however, accelerated rates of change in the Northeastern US during the 20th century and projected over the coming century are largely driven by an increase in ocean water volume due to global warming and from glacial melting 7. There may be a future tipping point where salt marshes will largely be unable to keep up with rates of sea level rise. Research suggests that when sea level rise rates exceed a certain threshold, marshes convert to tidal flats; thresholds (>2 mm or 0.08 in per year) have already been crossed in southern New England and Long Island salt marshes and there is a shortage of sediments needed to maintain stable salt marshes (e.g. concentrations of 2 mg per liter) 17. Between 1921 and 2014, sea levels rose in Boston, Massachusetts by 0.11 inches per year. Mid-century projections suggest much of the region will experience between 8 and 30 inches of sea level rise relative to sea levels during the early 2000s. Sea level projections towards the end of the century could range from 11.4 inches (current sea level trend) to 79 inches (high emissions scenario) in Massachusetts 19. In Wells, Maine, a sea level rise of 0.2 inches (5 mm) per year at current accretion rates leads to marsh expansion at the rate of 1.14% annually, but with sea level rise rates of more than 0.4 inches (10 mm) per year, marshes deteriorate at an annual rate of 0.5% 18. Sediment pollution typically refers to sediment suspended in the water column after a runoff event that can have adverse effects on aquatic and marine species, versus adding sediment to salt marshes as a restoriation technique to help stabilize marshes by supplementing accretion and elevation gain rates and providing structure to facilitate marsh plant growth. Some plant species may not be able to tolerate projected temperature increases, which could alter plant community structure. Stressors caused by human activities may further reduce the ability of salt marshes to cope with sea level rise and temperature changes. These include nutrient and pollution loading from agriculture and sewage, sediment altering activities such as dredging and erosion prevention structures, invasive species, and tidal restrictions 3,4,9. In Massachusetts, the high abundances of purple crabs has depleted marsh vegetation through consumption and burrowing, leaving certain areas vulnerable to erosion 10,15. Many low-lying coastal urban areas such as Boston were previously salt marshes, but were filled in with sediment for development purposes. Salt marsh adaptation and resilience will vary and be highly local in scale, depending on human activities, ocean and sediment transport processes, and local rates of sea level rise. 1. Baumann, R.H. 1980. Mechanisms of maintaining marsh elevation in a subsiding environment. M.S. Thesis. Louisiana State University, Baton Rouge. 2. Costanza, R., O. Perez-Maqueo, M.L. Martinez, P. Sutton, S.J. Anderson, and K. Mulder. 2008. The value of coastal wetlands for hurricane protection. Ambio 27:241-248. 3. Culbertson, J.B., I. Valiela, M. Pickart, E.E. Peacock, and C.M. Reddy. 2008. Long-term consequences of residual petroleum on salt marsh grass. Journal of Applied Ecology 45: 1284-1292. 4. Deegan, L.A., D.S. Johnson, R.S. Warren, B.J. Peterson, J.W. Fleeger, S. Fagherazzi, and W.M. Wollheim. 2012. Coastal eutrophication as a driver of salt marsh loss. Nature 490:388-394. 5. Enos, S.W. 2015. Reconstruction of the Post-Glacial Formation of the Peddocks Island Salt Marsh, Hull, MA. Standard Theses. Paper 23. 6. Goodman, J.E., M.E. Wood, and W.R. Gehrels. 2007. A 17-yr record of sediment accretion in the salt marshes of Maine (USA). Marine Geology. Volume 242: 109-121. 7. Horton, R., W. Solecki, and C. Rosenzwig. 2012. Climate change in the Northeast: A Sourcebook. Draft Technical Input Prepared for the U.S. National Climate Assessment. 313 p.
8. MA CCVA: Manomet Center for Conservation Science (Manomet) and Massachusetts Division of Fisheries and Wildlife (MA DFW). 2010. Climate change and Massachusetts fish and wildlife: Volume 2 habitat and species vulnerability. Massachusetts Division of Fisheries and Wildlife, Westborough, MA. 9. [MA SWAP] Massachusetts Division of Fisheries and Wildlife. 2015. Massachusetts State Wildlife Action Plan 2015. Westborough, MA. 10. National Park Service (NPS). Cape Cod National Seashore: Crab driven vegetation losses. Accessed 06/08/2016. 11. Nixon, S.W. 1982. The ecology of New England high salt marshes: A community profile. United States Department of the Interior, Washington, D.C., U.S.A.
12. Oakley, B.A., J.C. Boothroyd. 2012. Reconstructed topography of Southern New England prior to isostatic rebound with implications of total isostatic depression relative to sea level. Quaternary Research 78:110-118. 13. Redfield, A.C., and M. Rubin. 1962. The age of salt marsh peat and its relation to recent changes in sea level at Barnstable, Massachusetts. PNAS 48:1728-1735. 14. Silliman, B.R., and M.D. Bertness. 2004. Shoreline Development Drives Invasion of Phragmites australis and the Loss of Plant Diversity in New England Slat Marshes. Conservation Biology 18:1424-1434. 15. Smith, S.M., M.C. Tyrell, and M. Congretel. 2013. Palatability of salt marsh forbs and grasses to the purple marsh crab (Sesarma reticulatum) and the potential for re-vegetation of herbivory-induced salt marsh dieback areas in cape cod (Massachusetts, USA). Wetlands Ecol Manage 21:263-275. 16. Smith, S. 2015. Vegetation Change in Salt Marshes of Cape Cod National Seashore (Massachusetts, USA) Between 1984 and 2013. Wetlands 35:127-136. 17. Watson, E.B., A.J. Oczkowski, C. Wigand, A.R. Hanson, E.W. Davey, S.C. Crosby, R.L. Johnson, and H.M. Andrews, 2014: Nutrient enrichment and precipitation changes do not enhance resiliency of salt marshes to sea level rise in the Northeastern U.S. Climatic Change, 125, 501-509. 18. Torio, D.D. and G.L. Chmura, 2013: Impacts of sea level rise on marsh as fish habitat. Estuaries and Coasts, DOI 10.1007/s12237-013-9740-y. 19. Massachusetts Executive Office of Energy and Environmental Affairs, 2011: Massachusetts Climate Change Adaptation Report. Executive Office of Enery and Environmental Affairs and the Adaptation Advisory Committee. 128 p.
New Hampshire Fish & Game Department. 2013. Ecosystems and wildlife climate change adaptation plan. Concord, NH.